The city of Brisbane on Australia’s Gold Coast is often overlooked because it doesn't have big tourist-drawing sights like an Opera House or Great Barrier Reef. What is does excel at, however, is a happy, healthy lifestyle for lucky residents and the tourists who come to experience it. Furthermore, a mixture of public parks, Australia’s only urban beach, and child-friendly galleries make this city great for exploring with your family. Brisbane’s Gallery Of Modern Art on the South Bank turns modern art into fun for all the family. In a dedicated Children’s Art Centre they present a variety of free interactive exhibitions, which parents will enjoy as much as the kids. Presently they have teamed up with LA-based Australian artist Jemima Wyman on the immersive ‘Pattern Bandits’ exhibition, which explores the relationships between pattern, people and architecture. Children are encouraged to make their own collages, which will appear on the gallery walls. Plus by utilising a range of multimedia there are sections where the visitor becomes the artwork themselves. Even adults have been known to spend hours playing with the cameras in the Harlequin Hallway (myself included!). 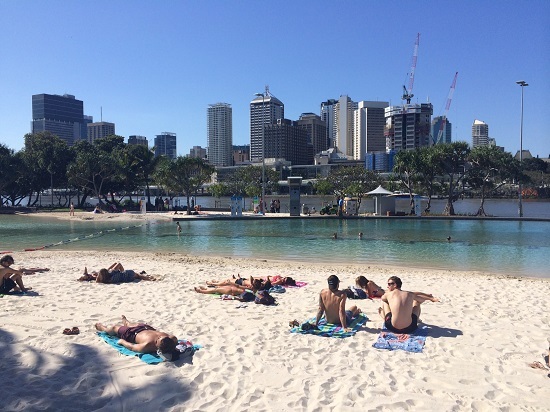 Brisbane’s South Bank is also home to Australia’s only inner-city, man-made beach. Streets Beach features shallow lagoons, soft white sand and offers a unique view of the city skyline. The beach is free to use and is patrolled by qualified lifeguards year round. The South Bank Parklands also offers a number of child-friendly eateries like the Surf Club (the fish and chips is especially good) and Nitrogenie, where ice cream is ‘magically’ made from liquid nitrogen. 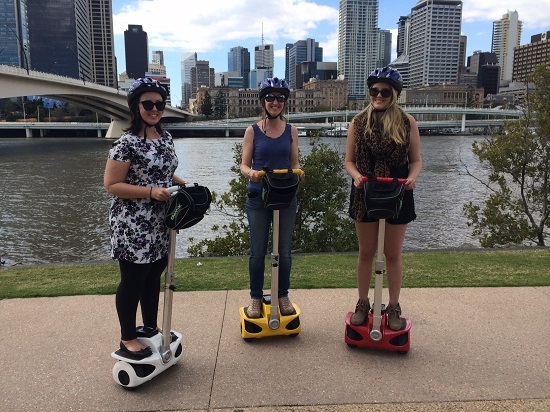 For a novel way to explore the South Bank Parklands book a tour with Xwing – the mini Segway. The Xwing requires you use your body weight to move and steer the upright vehicle, but don’t worry; all tours come with an induction session, safety helmet and full training before you are let loose on the pathways. Tours come with a personal guide who will take you along the South Bank and over the Brisbane River, stopping for a brief history lesson and photo opportunities along the way. For younger children New Farm Park offers over 37 hectares for them to run around and let off steam. The main attraction here is that hidden amongst giant fig trees is a wooden adventure playground and jungle gym – it’s the perfect place to play hide and seek. During October and November the park area turns purple as the jacaranda trees come into bloom. 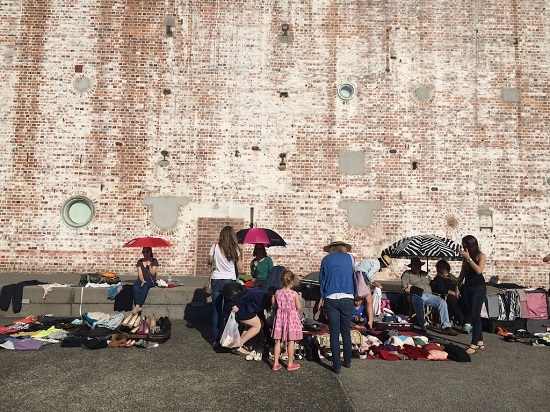 Plus at the nearby Brisbane Powerhouse, a free live music venue and arts space, they hold weekend markets including the pop up Suitcase Rummage, where you can bargain hunt for upcycled, recycled and vintage goods. 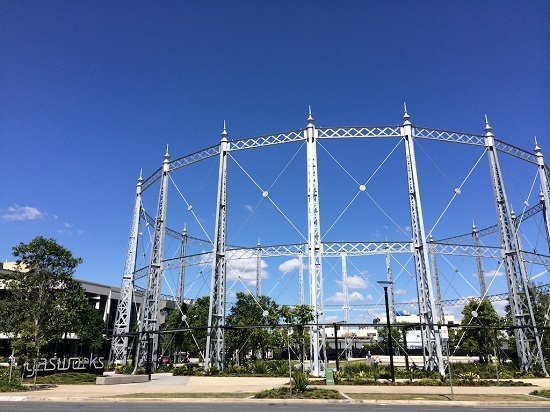 A Gasometer from the 1800 has become the unlikely focal point for a retail, dining and entertainment precinct in the Newstead Riverpark. The distinctive structure at the centre of the Gasworks Plaza comes to life through a choreographed 10-minute light and sound show (every Friday and Saturday night at 7pm and 9pm) and attracts an audience of all ages. The Plaza is a particularly family-friendly area, you will often see families picnicking in the centre of the Gasometer or enjoying meals at any number of the precinct’s trendy restaurants. You can enjoy Italian cuisine at Buzz, Seafood or Sushi at Reef or grab something healthy at Lorna Jane’s Nourish Café. From the arts to parks, Segway and Streets Beach, there are things to do with the family in Brisbane that will keep everyone happy. Book your Australia holiday with Flight Centre today! Jayne Gorman is a freelance travel blogger and social media manager who is currently based in Australia. Find her blogging about travels, sweet treats and street art at Girl Tweets World or on twitter as @jayneytravels.